A long time ago, before you and I or any of us were here, during the olden times of giants and ancient warriors in the land called Japan, there lived a very smart and kind Emperor. People attributed his wisdom and kindness to his magical councillor. A giant koi fish, who dwelled in a special pool built for him in the middle of the castle, and which legends says, was able to speak and had a bit of a temper. This koi was called Kotei. When Kotei was a young fish, and therefore a bit immature, in a wave of rage swallowed an entire fishing town off the coast of one of Japan's many islands. That is how the Emperor got to hear of him, and how they became best friends. The Emperor took him into his palace, and promised to keep him fed and happy, as long as he remained his trusted councillor. Many years passed, in which their friendship flourished. Kotei was happy, and grew to enormous caliber. The Emperor ruled a happy kingdom, and everybody prospered. Then, as legend tells, the tide changed and strange things begun to happen. The country was ridden with sickness, and Kotei was unable to give a good answer to his Emperor. The ruler, worried for the health of his dying people and angry at his councillor for not giving him the answer to fix it, ordered the fish to be killed. Kotei tried to escape but didn't make it too far. He was injured and knew that his time had come. He managed to reach a small village, and talk to a talented swordsmith. He ordered him to make katanas out of his ribcage bones, and told him that these swords would always find themselves in the hands of those who belong guiding and ruling their country. The swordsmith did as he was told, and created unique katanas from the rib bones of beautiful Kotei. Echoes the impermanence of all things. Like a passing dream on a night spring. To be no more than dust before the wind. A classical japanese poem, taken from the Heike monogatari. 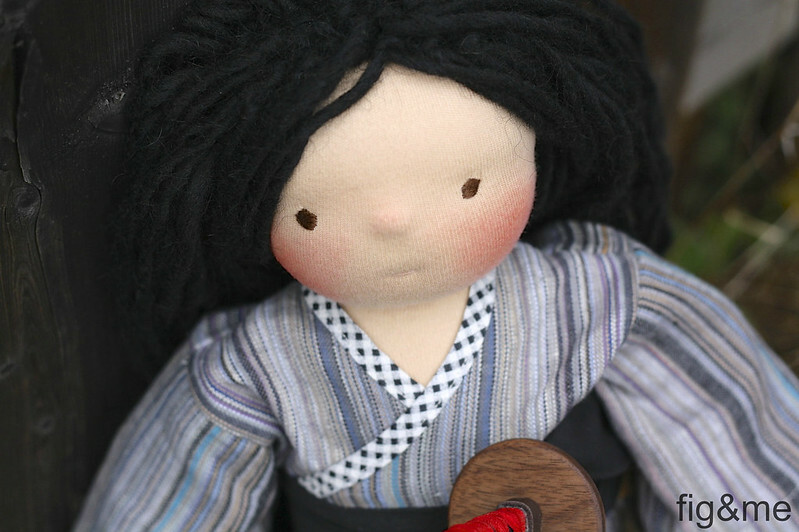 Daisuke is a little doll, inspired by the japanese culture. It has been so much fun to dream up these little boys, to work with my husband and take note of his creativity (names, characters and mythology employed in this tale are his doing, I merely put it into words), and to be able to finally share them with you all. 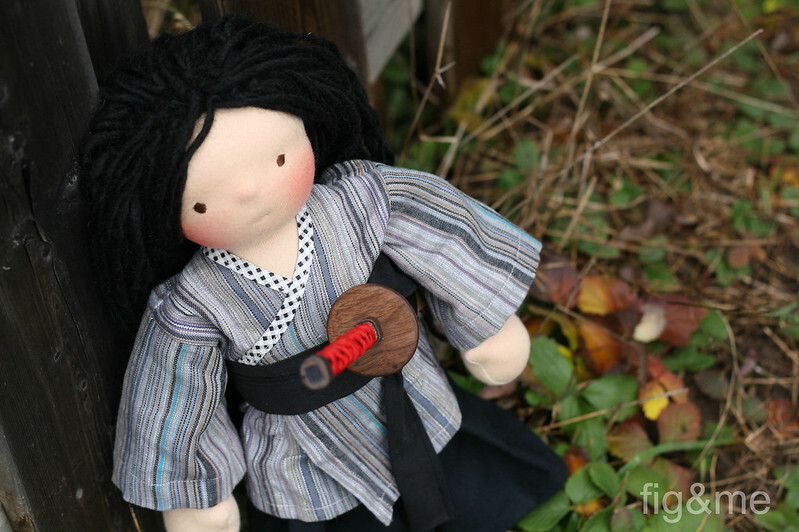 Daisuke is a 14" tall doll, made with cotton and stuffed firmly with clean wool. His long hair is made of wool strands, attached one by one to a cap sewn to his head. His facial features are embroidered, his rosy cheeks blushed with beeswax. He is wearing a kimono top made of linen, and hakama-inspired pants made of cotton, as well as an obi belt. His boots are made of wool. Daisuke's katana was made by my husband, specifically for him. It is made of wood, and trimmed in leather and fabric. 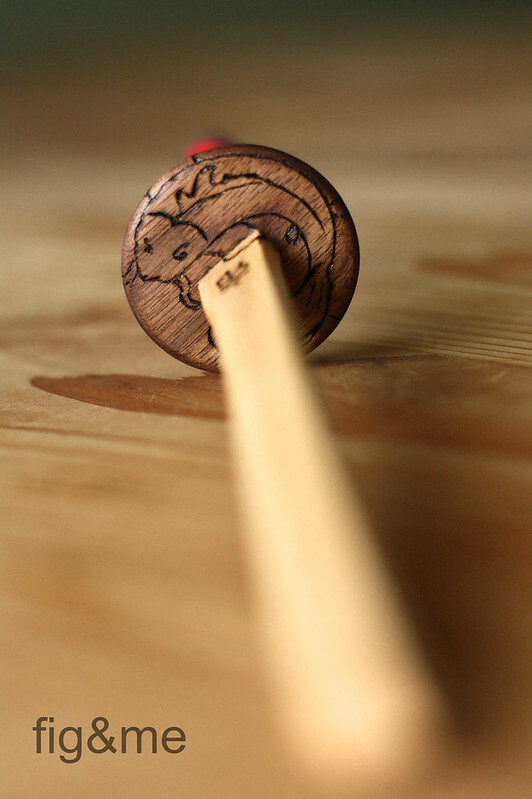 It has an etched koi and kanji symbols for the word Mikado, meaning emperor. 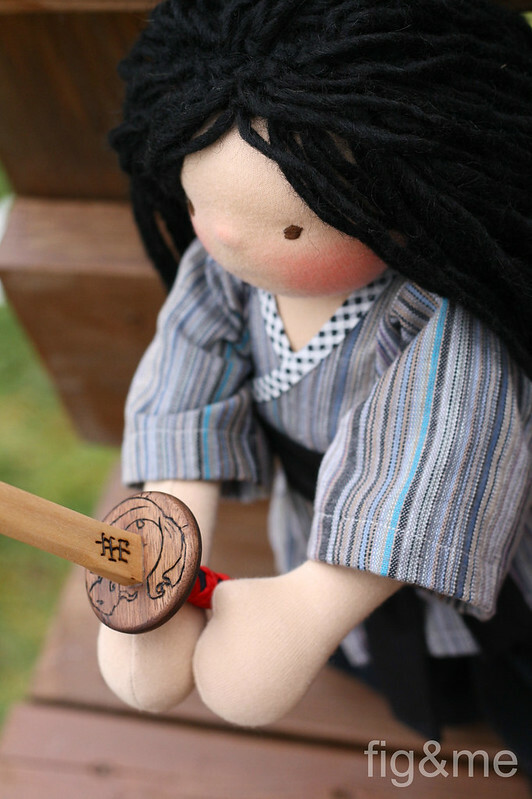 The sword has been finished with natural materials, and suits little Daisuke perfectly. 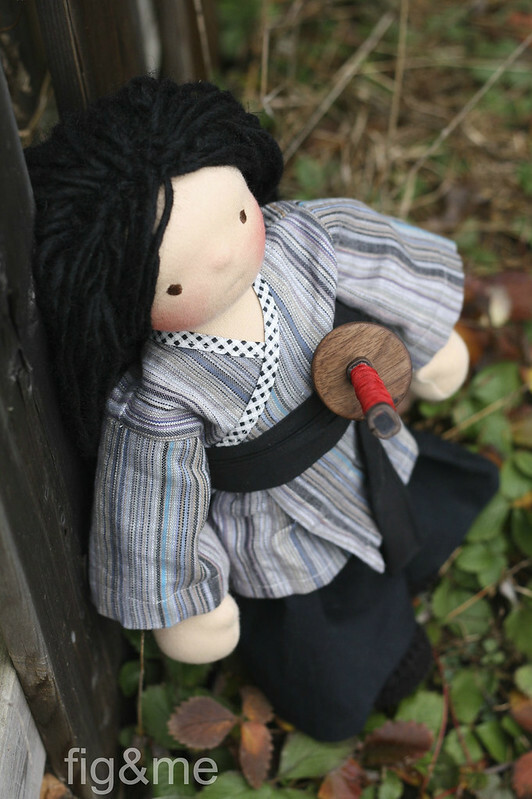 If you would like to invite little Daisuke into your home, and let him infuse your daily life with his high ideals and japanese flavour, please leave a comment in this post with your name and email address, and we will select a person on Dec 5th, 2012 at 10 PM EST to proceed to purchase him. The price for Daisuke and his sword is $275 USD plus postage charges. Thank you kindly for reading about him, and good luck (in case you are interested in bringing him home). Thank you all that entered! We have just selected a person to take this sweet fellow home, and if all goes well he should be going home pretty soon. I have one more boy to share with you, but he played silly today so no photos yet. 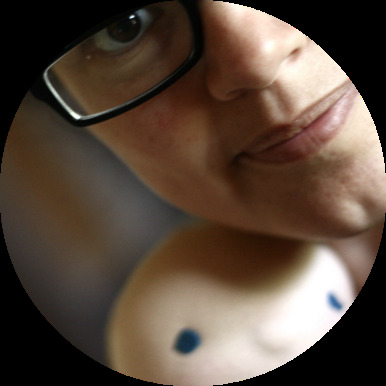 But tomorrow you will be able (with a little dusting of luck) to see some previews. I am just working on a few of his favourite things. Thank you again and see you tomorrow.